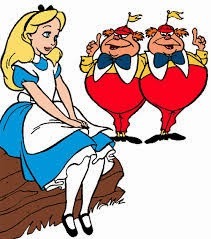 SILLY SONGS and SATIRE: Alice in Wonderland, Medical Version: "THE VALGUS AND THE CARBUNCLE"
Alice in Wonderland, Medical Version: "THE VALGUS AND THE CARBUNCLE"
ORIGINAL POEM: "The Walrus and the Carpenter", Lewis Carroll, set in part to music in the Disney animated cartoon, 1951. PARODY PUBLISHED: CMAJ 1995, J Nucl Cardiol 1999, reprinted here with permission of the author. Explanation of the parody lyrics: A historical vignette......In the 1990s, attempts to streamline medical care resulted in the propagation of standardized patient-care protocols, clinical guidelines, and “continuous quality-care initiatives”; these efforts were concurrent with extensive bed closures, reduced hospital stays, and expanded use of day-care procedures. Some health care workers felt that such developments were primarily economically motivated, and that care had been depersonalized. 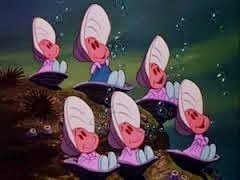 These lines compare the plight of assembly-line patients to the unfortunate oysters in Carroll’s poem. Shoved off, with all their gear. The [F] guidelines [G7] did be[C]seech.